NOT EXACTLY an update about Big Yao as this happened 3 weeks ago on August 25(Sunday). [color=darkred]I had delayed its posting because I had been waiting to get hold of the short but humorous public service announcement video featuring Yao Ming and Ye Li. 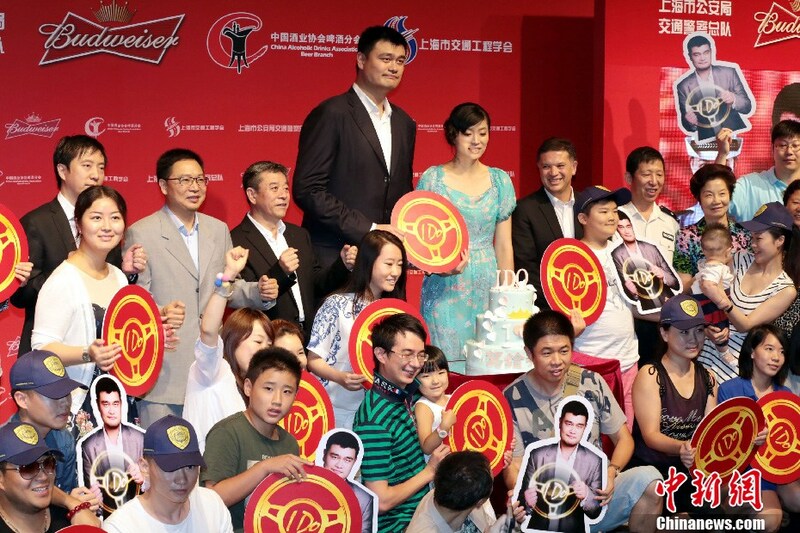 Yao Ming and Ye Li were featured in this public service announcement produced by the Shanghai Municipal Public Security Bureau Traffic Police Corps, Chinese Wine Association and Anheuser-Busch InBev together. Another news clipping about the subject. 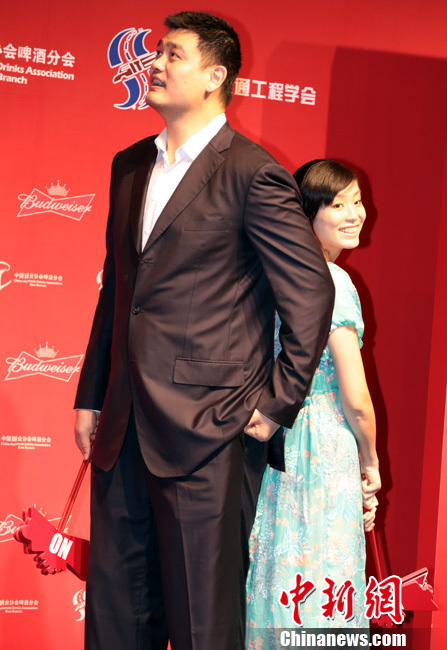 Retired Chinese professional basketball player Yao Ming now features in a short film, co-starring with his wife Ye Li. The film, focusing on the dangers of drunk driving, was released yesterday in Shanghai. "I'm not a professional actor. The acting was hard for me, but I enjoyed working with my wife." Yao said. Calling for safe driving, this public-service short film tells the story of one designated driver, played by Yao Ming, who is forced to make tough choices between drinking and driving, work and family, commitment and responsibility. 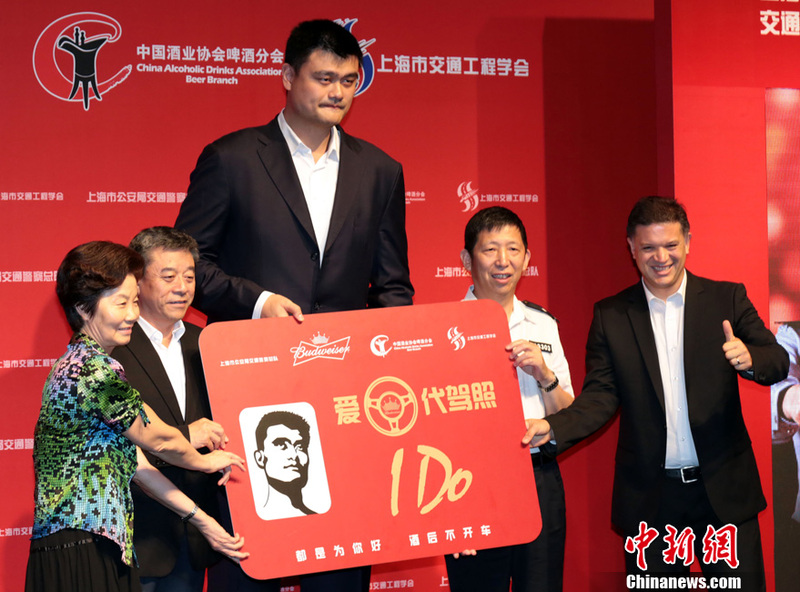 When asked about whether he intends to start a movie career, Yao claimed to have no such plans. "I don't think I have any acting talent. Ye and I are just amateurs. But we really enjoyed making this film." Yao said, "The film was shot on Father's day. I want to set an example for our future generations and encourage more people to be aware of safe driving." Yao and Ye's daughter has long been the focus of attention. Many think that 3-year old Qinlei has already reached a height of 1.3m, judging from a photo released online. 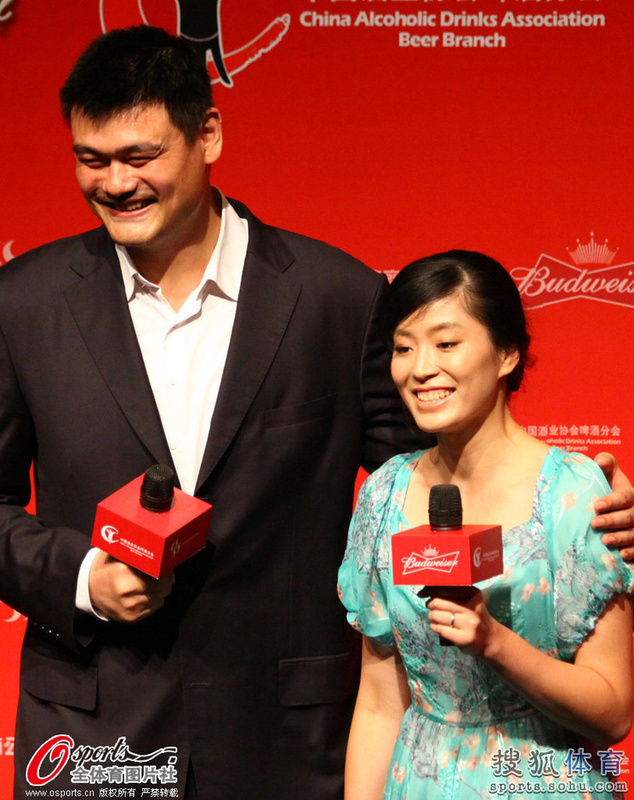 When a reporter asked about this, Yao answered, "Oh no, she's much shorter than that." Yao also stated that he would not put too much pressure on the kid. "It's her choice whether to play basketball or not." Some photos from the premiere on August 25 in Shanghai. Here is a poster of the PSA as well as videos at the premiere and the PSA itself. I have provided 2 links to the PSA, and hope it will work outside of China. Another news clipping about the PSA. China's tallest entrepreneur, basketball club owner and political adviser now has put on a new hat, as designated driver. 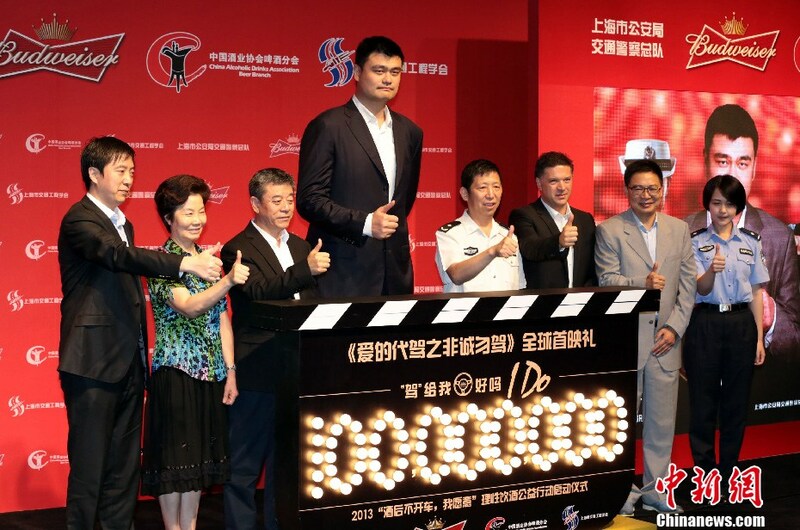 Yao Ming, the 2.26-meter hoops icon who in various roles has maintained his influence off the court after retiring in 2011, has taken another challenge by starring in a mini movie to promote responsible drinking. 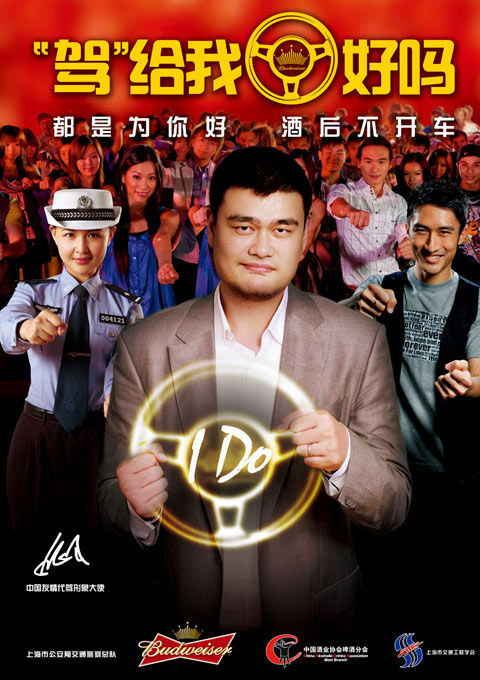 In the nine-minute clip, Yao plays the character of "Boss Yao", who voluntarily drives his drunken colleagues home but one day found himself in urgent need of a chauffeur as well after drinking at a business dinner. While he struggled to find a competent driver, his wife Ye Li appeared and drove him home. "What we acted is actually what happened in our real life," Yao said at a press conference to release the movie last week. Yao, who has shown his witty humor and acting skills in a 2004 documentary The Year of the Yao and countless TV commercials, says working in the studio is much tougher than training on the court but expected his amateurish performance could raise social consensus on responsible drinking in a light-hearted way. "We don't want to preach," says Yao, who was inspired and invited to shoot the film by world-famous brewer Anheuser-Busch InBevh. "We just wanted to tell a story that true love needs a designated driver and hope it could influence people in a warm way. "Driving safe is not only responsible to your families but also to every passerby on the street, so if everybody stands up we will have a safer environment." Ye echoes her husband's sentiment, saying being a designated driver is a happy burden for every wife. "This is a real-life subject and making it into a movie works well to educate people," Ye says. However, what amazed Yao wasn't Ye's acting but her look in makeup, which the former women's national team member rarely applies in daily life. "She looks gorgeous," Yao says. Although extending careers to the big screen seems a popular choice for retired sports celebrities, Yao says he has no intention to make it in the entertainment scene. "I just simply don't have the talent," says the former Houston Rockets' center, who also appeared in China's national image promo shown at Times Square in New York in early 2011. Since organizing his first charity game in 2007, Yao has enthusiastically engaged in socially responsible programs, establishing his own Yao Ming Foundation to build hope schools and assist children in underprivileged areas while promoting ideas like returning sports to schools and wildlife rescue. The giant launched a nationwide charity program, the Yao Ming Foundation Hope Primary Schools Basketball Season, last year and reached 79 hope schools over a two-month stretch, during which college volunteers and visiting NBA stars instructed children on basketball skills and taught them the virtues of teamwork, leadership and camaraderie. The responsible-drinking campaign was his latest initiative and was inspired by a father's sense of responsibility. "The movie was shot on Father's Day and I hope we can set ourselves as examples for our descendants," says Yao, who brought his 3-year-old daughter Yao Qinlei to a charity program despite media scrums earlier in Beijing. "Children start to consciously follow their parents' actions at that age and we hope to give her more positive influences." Ye, who married Yao in 2007, stresses it's more important to educate their daughter with action than words. However, whether little Amy (Yao's daughter's English name), who naturally inherits the couple's strong sports gene, will become a basketballer or an artist remains out of her parents' consideration. "We don't want to make early plans for her and we'll just let her grow her interests in every possible field," Yao says in response to a recent photo, which saw him shooting hoops in front of his daughter. "We won't push her to do anything at this early age but try to provide her with a more relaxed environment to let her do what she likes and eventually find out what is her strength." 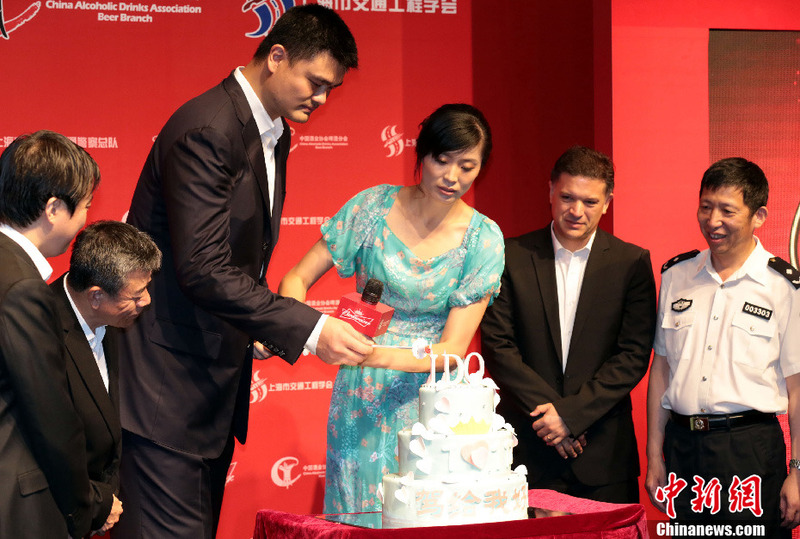 And on September 12 (Thursday) it was Yao Ming's 33rd birthday. In case you guys wondered what he is up to on that day, let me tell you. The workaholic was working on his birthday on another philanthropist undertakings of his: shooting PSA for WildAid. And the shooting location of the PSA was NOT in China but in London !!!! YES, Big Yao had flown to London and was filming 2 PSAs for WildAid together with 2 British heavyweights: The Duke of Cambridge aka Prince William and ex Manchester United megastar David Beckham !!! The PSAs are to urge consumers all over the world to not purchase illegal wildlife products, specifically rhino horn, ivory, and shark fin. The PSAs will be in English, Mandarin Chinese, and Vietnamese and to be broadcast globally in November. Here are just 3 photos I managed to scoop from the Internet. 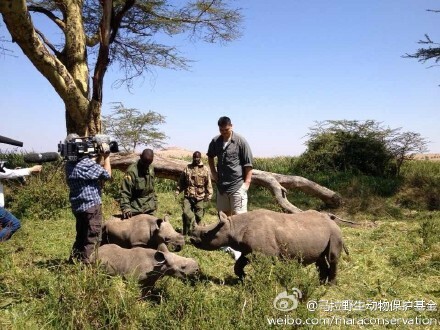 Details re the WildAid PSA project that Yao Ming is currently working on in London. The Duchess of Cambridge's husband and the ex-Manchester United star are working with 7 foot 6 inch NBA star Yao Ming to urge consumers not to buy illegal animal products. The trio are campaigning against products made from horns and ivory taken from rhinos along with shark fin in their work for charity WildAid. William, Becks and the Houston Rockets player met for a photoshoot for the charity. In one priceless shot Wills and Becks stand either side of Ming who dwarfs over them, with the England football legend left craning his neck to see him. Another news clipping about the WildAid PSA initiative from Daily Mirror of UK. Suited and booted, David Beckham and Prince William have joined forces to campaign against illegal wildlife products. Wills and Becks were joined by Chinese basketball star Yao Ming in London yesterday to film a video on behalf of the WildAid organisation. The messages will be broadcast globally in November but their target audiences are in China and Vietnam, countries which have large markets for products like rhino horn and ivory. Speaking about why he decided to record the public messages, David Beckham said: "When I learned of the current poaching levels in Africa, I immediately agreed to help get this message out. "It is shocking to think that we could lose these animals from the wild in our lifetimes." 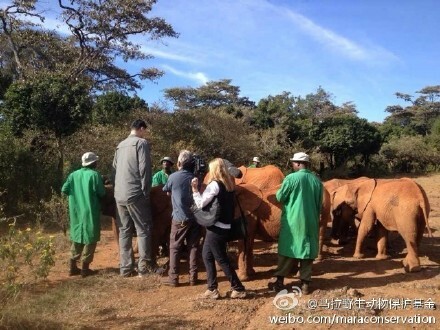 Former NBA star Yao Ming said: "We must reduce demand if we are going to save these animals. "We made tremendous progress reducing demand for shark fin soup through a similar campaign and a government ban at banquets is also helping. "Traders say shark fin demand has been cut by 50% or more. I hope we can do the same for ivory and rhino horn." Peter Knights, WildAid executive director, said: "In the messages the Duke of Cambridge, David Beckham, and Yao Ming will urge consumers to not purchase illegal wildlife products, specifically rhino horn, ivory, and shark fin." He added: "In one message they specifically talk about their concern as fathers, that future generations will lose these animals unless we can reduce the demand for endangered wildlife products. "In the second message they show how all the rhinos left in the wild could fit inside just one soccer stadium." William has described the threat of extinction that endangered species and habitats face as a potential "catastrophe". The Duke has also brought together leading conservation groups to tackle crises in the natural world starting with the illegal trade in wildlife. His Royal Foundation is working with seven organisations, including WWF-UK and the Zoological Society of London, in a partnership called United for Wildlife, of which William is president. William said: "The threats to our natural heritage are extensive, but I believe that this collaboration of the best minds in conservation will provide the impetus for a renewed commitment and action to protect endangered species and habitats for future generations. "At the root of the illegal wildlife trade, for example, is the demand for products that require the deaths of tens of thousands of these animals every year, pushing them further towards extinction. "We must work together to prevent this catastrophe and allow our children the opportunity to experience wildlife in its many beautiful and varied forms." A spokesman for WildAid, which campaigns to end the illegal wildlife trade, said: "The ivory trade claims the lives of an estimated 25,000 elephants annually and according to South Africa's Department of Environmental Affairs, as of September 5 at least 618 rhinos were killed for their horns in 2013, which may break last year's record of 668 poached rhinos later this month." Last night William and wife Kate were guests of honour at the inaugural Tusk Trust awards, held at the Royal Society in central London, which recognised the work of wildlife campaigners. It seemed like the WildAid PSAs filming had moved to Kenya !!! Yao Ming had left London and flown to Kenya yesterday (September 13); most probably the portion done in London was only a part of the PSAs. Not sure whether Prince William and David Beckham had flown there too. Yao Ming will stay in Kenya to work on the PSAs for the next 3 days (September 14 ~ 16). STRANGELY there had been ZERO PUBLICITY and media converage of Yao Ming's philanthropist works in Kenya for the past 3 days. Maybe Big Yao just wants to be AS LOW PROFILE AS POSSIBLE. After all, just as the Chinese idiom said 為善不欲人知, i.e. Those who do good deeds, should not do so out of a desire for others to know about it. He woke up early on September 14, visited an orphanage for elephants in Nairobi and shot part of the PSA. Then he took a close to 5 hours bumpy ride to Kenya's Ol Pejeta Conservancy for more shooting of the PSA amongst elephants and other wildlifes. Then on September 15, Big Yao and the filming crew went to the Lewa Widllife Conservancy in Northern Kenya, home to a wide variety of wildlife including the rare and endangered black rhino, Grevy's zebra and sitatunga. Lewa holds over 12% of Kenya's black rhino population and the largest single population of Grevy's zebras in the world (approximately 350 individuals). Here are 2 photos of Big Yao with 3 orphan black rhinos whose parents were killed by poachers.